It was Theresa May's controversial big idea, to open a wave of new grammar schools in England. It dramatically restarted a row over academic selection at the age of 11 which for almost 20 years had been quietly sidelined. The speech defining her vision of a "great meritocracy" was just last September, but those plans have been shredded by the election. So what has changed for England's 163 grammar schools and the many non-selective schools affected by them? On the surface apparently nothing, beneath that almost everything. Or, as one grammar school leader said to me "politically, grammar schools are now an issue in a way they weren't. The 1997 ban on new selective schools brought a truce. David Cameron respected that truce." The school of Theresa May's former chief of staff, Nick Timothy, has a special place in this story. King Edward VI Aston School looks like a bastion of tradition, but it's taken a radical step to become more inclusive. At Aston a quota system has been introduced to set aside 25% of places for pupil premium children who had passed the entrance test. This means their family income will have been low enough at some point in the last six years to entitle them to free school meals. Similar quota systems were widely expected to be part of any plans for new grammar schools, which overall have only 3% of pupils on free school meals. There was even the possibility they might have been applied to existing grammar schools. 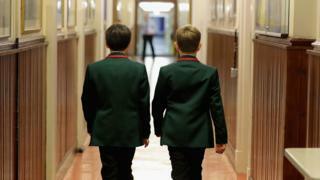 Did grammar schools help social mobility? Grammar schools: What are they and why are they controversial? Aston is part of a foundation that runs six of Birmingham's grammar schools. Executive director Heath Monk thinks the ditched plans, guided by May's chief of staff, might have been more surprising than many realised. "Nick Timothy was unique in seeing the expansion of grammar schools, and making them more inclusive, as part of the same agenda." Grammar schools, quietly tolerated for years, found themselves in the spotlight. Our BBC investigation of admission policies showed fewer than half gave priority to poorer children when allocating places. This included some schools with poor neighbourhoods on their doorstep. A new law might have compelled grammar schools to change, but without that what will happen to efforts to make them socially inclusive? At the King Edward VI grammar schools Mr Monk says they hope to go significantly further than the current 20-25% quotas. The risk of slightly lower exam results down the road is one they can take as the foundation runs most of the grammar schools in Birmingham. About 5% of England's secondary school pupils are educated in a grammar school. The influence of selection is greater, because grammar schools only give places to about a quarter of the children in their areas. The other local schools accept children who don't reach the score needed, don't sit the test or have special needs. "We'll be back to the bad old days, where people didn't recognise we still had grammars and secondary moderns," Ian Widdows tells me. He's the head teacher at Giles Academy in Boston Lincolnshire, which he is proud to call a secondary modern. He set up the National Secondary Moderns Association to gain recognition that they do a good job for the pupils they have. This matters, says Mr Widdows, because the system that judges how schools are performing uses GCSE results as a key measure. "It's based on a misguided assumption that we have a comprehensive system," he says. But there is now a new performance measure, of the progress made by pupils, which should make the system fairer. There are 163 grammar schools in England, but just 213 schools classed as "non-selective schools in highly selective areas", which are effectively secondary moderns. Many more do not wish labelled as such, perhaps fearing some kind of stigma. But Ian Widdows believes the true number of secondary moderns is closer to 600. There is just one recent example of a new grammar school site opening. In Sevenoaks this September the first pupils will arrive at what is officially an annexe of the Weald of Kent grammar school more than 10 miles away. Threatened legal challenges have been dropped, but the new site will be closely watched by anti-selection campaigners. It will have to prove it is truly operating as part of the existing grammar school. Such is the legal complexity that few believe there will be more grammar annexes of this kind in the near future. That does not mean the number of grammar school places will not go up. None of the £50m promised by Theresa May for expansion appears to have been allocated, and it's not clear if its still available. But in counties such as Gloucestershire grammar schools have simply expanded on their existing sites, to the consternation of other secondary head teachers who face losing pupils and money. There's a simple reason why some grammar schools are adding a form of entry, as each pupil brings funding. "A significant number of grammar schools are looking at a very bleak financial future," says Charlotte Martens, vice-chairman of the Grammar School Heads Association. This is partly an accident of geography, as many grammar schools are in lower funded areas. The low number of pupil premium pupils they admit also means less money. As head teacher of Rugby High School, Charlotte Martens has decided to join forces with a nearby non-selective academy to form one organisation running both schools. In the last budget Philip Hammond promised to extend free school transport to up to 15 miles for poorer pupils attending a grammar school. It's a promise she hopes they keep as it would allow her school to extend its catchment for children from low income families to Nuneaton or Hinckley. That would make the school more inclusive and bring in more money. Ms Martens also thinks the debate has shifted significantly after the last year. "It's opened up some wounds which go back a long way, everybody feels slightly shakier," she said. Privately many argue that canny grammar schools will have to keep on changing to survive. Politics is in a more febrile and unpredictable state than for a generation. The truce, now broken, means it's not impossible that calls for the abolition of existing schools could reappear from the left.